Tags: arrest, Big Mike, Bouncer, Christopher David, Daniel Street Tavern, Felony, Free State Project, Illegal, Monopoly, Portsmouth, Taxi, Uber, Wiretapping. 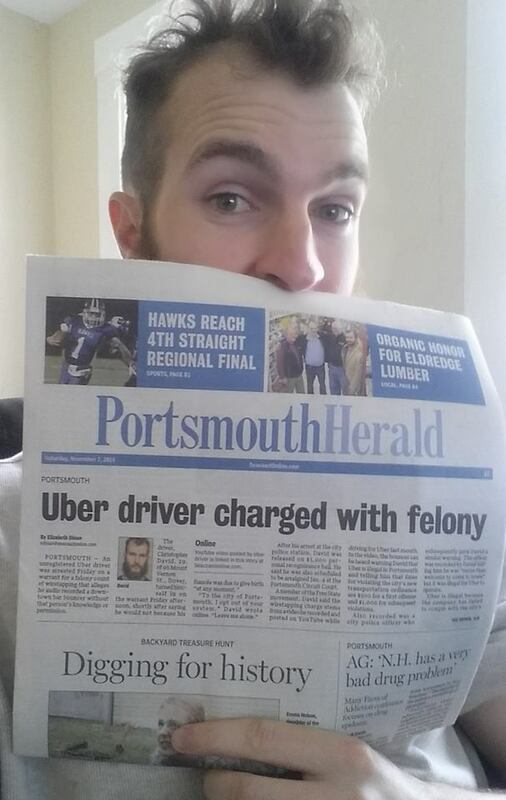 Uber driver Christopher David, age 29, turned himself over to law enforcers in Portsmouth New Hampshire yesterday, Friday, November 6, 2015 after the gang issued an order to kidnap him for the alleged crime of felony wiretapping. The charge was in response to a YouTube video posted by David featuring an encounter he had while picking up passengers from the Daniel Street Tavern. In the recording, a doorman and part-time cab driver called “Big Mike” can be heard snitching on David to a nearby law enforcer (operating an Uber is violation of a Portsmouth city ordinance). The enforcer chose to exercise discretion in that instance and did not issue a ticket (or even a warning) to David. However “Big Mike” complained to law forcers about the YouTube video and had David charged with wiretapping. That is a Class B Felony in New Hampshire, punishable by up to 7 years in prison. Christopher David gives people safe rides home from the bar in his Uber. A bouncer at the bar (who happens to also be a cab driver) unsuccessfully tries to get his competition fined. This public encounter is recorded and uploaded to YouTube. Now the Uber driver is facing 7 years in prison for recording what happened. Was this the intent of the “wiretapping” law? 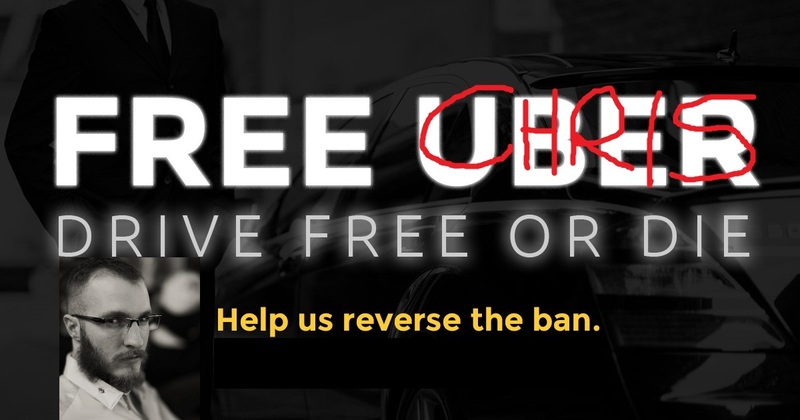 David was released on $5,000 personal recognizance and has been warned that he will go straight to jail if he continues to operate as an Uber driver, depriving him of income. His wife happens to be pregnant with the couple’s first son and is due any day now. That second income could come in handy right now, but the badged criminals in Portsmouth would prefer he go without (while continuing to pay their salaries, of course). Protesters organized a rally outside the Daniel Street Tavern where the encounter took place. They called on the law enforcers to drop the charges against the Uber driver. The bar owner asked law enforcers to shut down the protest, but protesters remained outside to raise awareness among the community. One would think a place that serves liquor to the public would have a vested interest in helping their customers get home safely. Instead, their bouncer “Big Mike” has been harassing Uber drivers and is now filing frivolous criminal charges against one for videotaping his harassment, in public. Christopher David’s arraignment is set for January 4, 2016. For more on this story, stay tuned to CopBlock.org and FreeUber.org. The New Secessionists Declare Independence!